Goodenough (Nidula) Island is a roughly circular volcanic island with 26 km diameter and the westernmost of the D'Entrecasteaux Islands off the NE end of New Guinea. Goodenough volcano contains several young basaltic-andesite and andesitic eruptive centers which may only be a few hundred years old. At present, there are thermal areas and hot springs in several areas, including 1.5 km north-west of Nou Nou, south-west of Wakala Hill, on the coast east of Bolu Bolu, and 3 km north of Bolu Bolu. Goodenough Island with its very steep cliffs might be one of the steepest islands in the world. 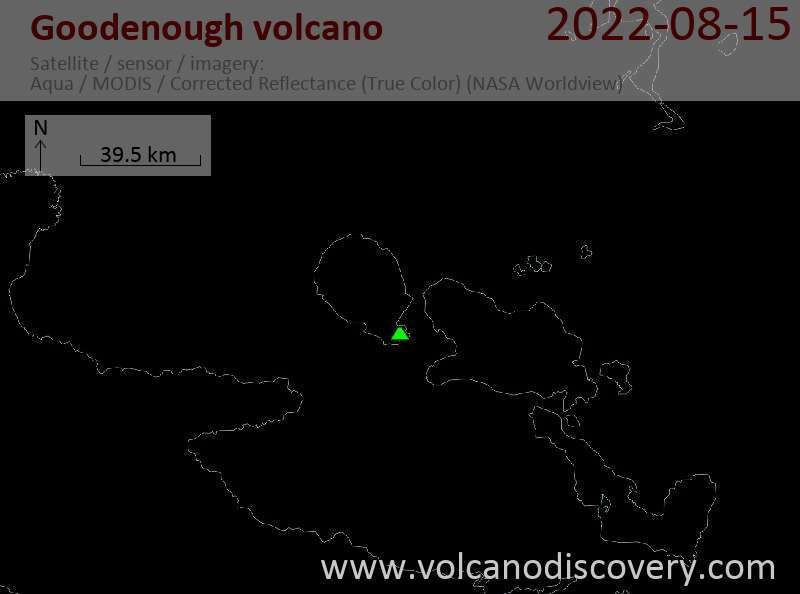 The volcanic centers of Goodenough Island are located around the margins of fault-bounded metamorphic rocks that form the central part of Goodenough Island. They can be roughly divided into a younger southeastern and an older northern area. The volcanic vents of southeastern Goodenough Island cover an area of about 30 km2 and extend from Gunawala Creek in the north to the Kilia coast in the south-west and Wagipa Island in the south-east. The youngest volcanic featuresa are 4 cones, inlcuding the Walilagi Cones, are located at the SE end of the island. These well-developed cinder cones with associated blocky lava flows on the northern and eastern flanks of the Bwaido Peninsula have probably erupted within the past few hundred years. Mount Oiava'ai is a 450 m high and 1.5 km wide lava dome on the northern alluvial plain. Wataluma Hill is the highest of a group of rounded cones rising above the plain in the NE of Goodenough Island. The small Nuamata Island off the north coast of Goodenough Island is a lava dome that erupted olivine-bearing andesite. A lava flow dipping 55 deg to the west is a prominent feature.